F2 Savannah kittens for sale. Bottle raised to be human imprinted Golden and silver colors. Growing up to 20 pounds. For over a decade we have specialized in bottle-raised F2 Savannah Kittens. F2's produced from our bloodlines are sought after around the world for their vibrant coats, dramatic spots, friendly temperaments and large size (17-22 lbs). 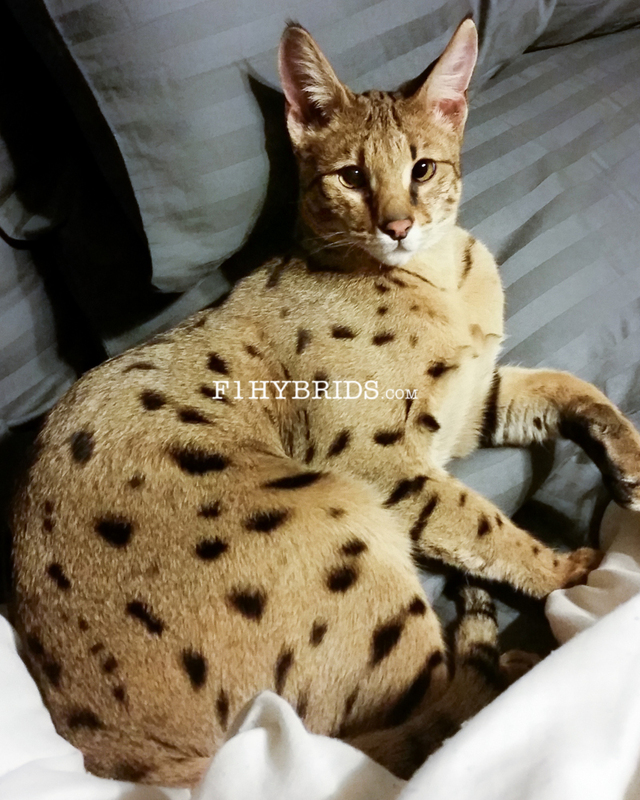 F1 & F2 generations are the most sought after due to retaining the larger exotic cat size. Savannah Kittens from us are bottle-raised with our developmental program which exposes them to different surfaces, toys, textures, and noises to gain well-rounded personalities. Savannah Kittens from us will leave with a microchip, age appropriate vaccinations, full veterinarian exam, health record, health guarantee and fixed. A legally-binding sales contract will be signed prior to any payment. Kittens can be picked up in person or meet you at our airport (TYS). We also offer a hand-delivery service in cabin. Click on each kitten to view it’s individual page! Under evaluation, until they are old enough to determine general temperament. Email us a detailed message to be put on the serious waiting list. They will leave fixed, micro-chipped, age appropriate vaccines, dewormed, full veterinary exam, metal bolt carrier with top door and TICA paperwork. Please send us a detailed email to be put on our private waiting list. What age do kittens leave? : Your breeder should keep kittens till at least 12wks-16wks. TICA code of ethics requires kittens to stay until at least 12 wks old. During this time kittens are learning proper manners from their litter-mates. Studies prove that core vaccines may not be effective till -+16wks of age when moms antibodies leave. Breeders offering early spay and neuter keep kittens until they are healed completely. Pricing: Prices of our Savannah Kittens reflects confirmation to breed standard, temperament, vet care, bottle-raising, difficulty to produce and documentation of all our cats (adults/examples/selected kitten). We want you to find the best kitten for your home. We put in the extra time to evaluate our kittens prior to placement. Transport: Come visit us to see your kitten in person. We can also meet you at our airport (TYS). Hand delivery is an additional service we are also happy to provide for your convenience. Traveling with a client’s pet is a very big responsibility that we take seriously. We fly with your pet in cabin on the airplane (never cargo) and hand deliver to you at your nearest airport. No strangers will be handling your pet. Your pet is seated with us on the airplane and never leaves our side, being cared for all the way. Verification: Scammers are making websites. Scammers are quickly identifiable as not TICA registered. Verify your breeder is TICA registered by asking for their membership card, their voluntary code of ethics and TICA.org website listing. Ask for all of these items then double check with TICA. We strongly suggest picking your kitten up in person. When you pick-up in person you're ensuring your kitten and breeder are real. Thank you for considering our program. We look forward to your inquiry.